Moshe Aviv Tower is a 250 m (820 ft) tall skyscraper located in the demarcated area of the bursa (Israel Diamond Exchange) on Jabotinsky Road in northern Ramat Gan, Israel. 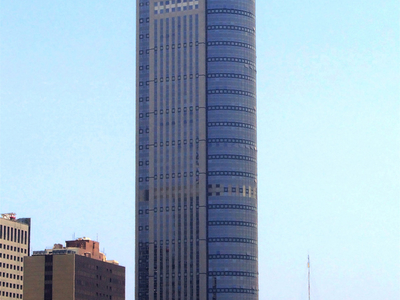 The 68-storey building is commonly known as City Gate (Hebrew: שער העיר‎), its original name. It is the tallest building in Israel. The building was designed by architects Amnon Niv and Amnon Schwartz. It was named after Moshe Aviv, the owner of the construction company, who died in an accident in October 2001, before its completion. The design for City Gate was inspired by the famous Westendstraße 1 in Frankfurt. Construction on the tower began in 1998 and was completed in 2003 when the tower became occupied. The construction period was extremely short, achieving a sequence of five stories per month with only one shift of 40 workers. The rate of concrete placement per month was 3,000 m3 (3,900 cu yd) and on a typical floor there are 42 windows. Total cost of construction was US $133 million. The tower has a total of 180,000 m2 (1,900,000 sq ft) of space. The building appeared in a TV advertisement for the Mifal HaPayis national lottery before it was completed, in December 2002. To this date it is the most expensive single building in Israel. There is now an approved plan for a similar tower of the same height, the Elite Tower, across Jabotinsky Road, on the current site of the Elite Factory. 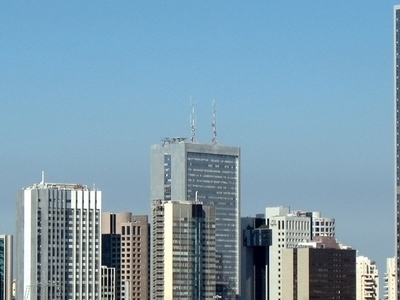 Here's the our members favorite photos of "Skyscrapers in Ramat Gan". 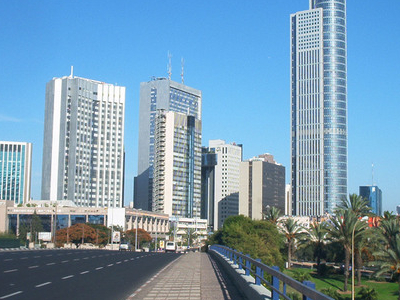 Upload your photo of Moshe Aviv Tower!